A total of 13,454,334.08 was released by the Department of Labor and Employment to student beneficiaries under the Special Program for Employment of Students (SPES). This program was in cooperation with the Provincial Government of Pampanga. SPES is an employment bridging program during the summer or Christmas vacation that aims to augment the family’s income of poor but deserving students. Under this program, the DOLE shoulders 40 percent of the salaries of beneficiaries, while their employers–government agencies, such as local government units, and private companies and other sponsor-institutions–pay the 60 percent. Through the continued support of Pampanga Governor Lilia Pineda the SPES program implementation has always been successful, DOLE RO3 Director Zenaida- Angara Campita stated. “The Provincial Public Employment Services Office (PESO) close coordination and efforts together with our major stakeholders and partner government and private agencies have greatly contributed to the success of the SPES Program. Without our partners, we would never have achieved the success implementation of this program,” Director Campita added. SPES beneficiary Antonette Mallari, BS Accounting Information System student of the Don Honorio Venture Technological State University was in glee of this program. She furthered that SPES program is beneficial especially for students who would like to gain work experience. “ibibigay ko po sa nanay ko yung pera, para siya na po bahala mag budget sa gagamitin ko sa aking pag-aaral”, Mallari added. Meanwhile, Purisima Catangan, mother of SPES beneficiary Jean Claude Catangan of the Holy Cross Sta. Ana, Pampanga said that truly this DOLE program elevates their morale as this government program reaches the under privileged members of the society. Purisima who always accompanies her son from processing to salary claims expressed thanks that the process was in order and easy especially for a 58 year old woman like her. “ Salamat po sa DOLE, sana po ay mas marami pa kayong matulungan”, she added. 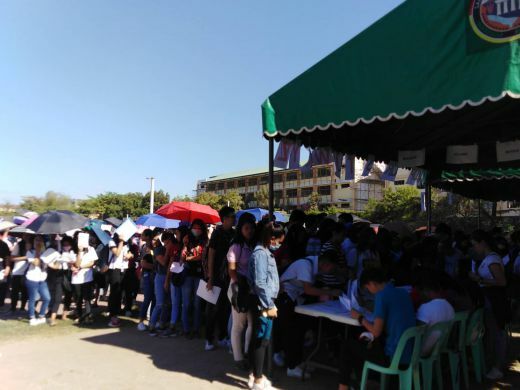 Alex Inza Cruz, Director II, Chief of the Technical Support and Services Division for Employment and Welfare was in close coordination with the Provincial Public Employment Services Office (PESO) during the entire salary distribution program. He said that this student beneficiaries age limit range from 15-30 years old and who worked 20-78 days. Students must also have an average passing grade to avail the program, he added. The SPES has been an annual employment program for students to immerse in government and private partners so as to hone their sense of leadership and public service. DOLE Region 3 ™ - © Copyright 2010 Department of Labor and Employment Central Luzon Region All Rights Reserved || Powered By: mispips!